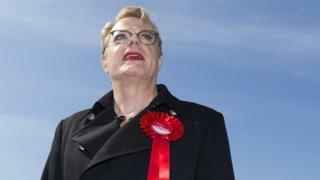 Comedian and actor Eddie Izzard has said he will try for a second time to become a member of the Labour Party's national executive committee. The LGBT rights campaigner, who failed to get an NEC seat in 2016, announced his candidacy in the Guardian. He said he wanted to stand for the executive to "break down barriers" and make the party more welcoming to groups who feel "isolated or excluded". The NEC governs Labour and helps steer its political direction. It consists of the Labour leader, deputy leader, frontbenchers, trade union representatives, constituency party representatives, councillors and members of the Parliamentary Labour Party. Izzard's open letter of intent comes after it was announced there would be three new seats on the committee. He said: "I've tried to give a voice to those who don't have one and to be an activist for the political party I believe has the best and strongest values, which will mean we can end poverty and move forward positively as a society and a country. "Now I want to stand for Labour's national executive committee so that I can break down barriers." He added that he wanted to help represent the LGBT community, people from disabled and minority backgrounds, and those who have suffered from mental health issues. The comedian is a prominent supporter of Labour, and has campaigned in 100 constituency seats for the party in the last four general elections. In Izzard's article in the Guardian, he says he wants "to help Jeremy Corbyn and the Labour Party take the fight to the Tories", but adds that he is not standing for a particular section of the party. It is expected that at least two of the three available seats will go to supporters of Mr Corbyn. Before party elections in 2016, the Labour leader's relationship with the NEC was fractious, but then six members of Corbyn-supporting groups gained seats. In 2016, Izzard came eighth in the ballot, gaining 71,000 votes. He said he was disappointed but was "in this for the long haul".